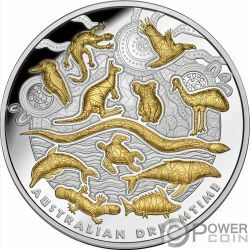 This incredible 5 Oz Silver coin is dedicated to a religio-cultural worldview attributed to Australian Aboriginal beliefs – THE Australian Dreamtime. The coin has a wonderful Gold plating, has a beautiful design, has a Proof quality and comes packaged in an original wooden box, along with the Certificate of Authenticity. Limited mintage to only 500 pieces worldwide! Dreamtime (also dream time, dream-time) is a term devised by early anthropologists to refer to a religio-cultural worldview attributed to Australian Aboriginal beliefs. It was originally used by Francis Gillen, quickly adopted by his colleague Baldwin Spencer and thereafter popularised by A. P. Elkin, who, however, later revised his views. The Dreaming is used to represent Aboriginal concepts of “time out of time,” or “everywhen,” during which the land was inhabited by ancestral figures, often of heroic proportions or with supernatural abilities. These figures were often distinct from “gods” as they did not control the material world and were not worshipped, but only revered. 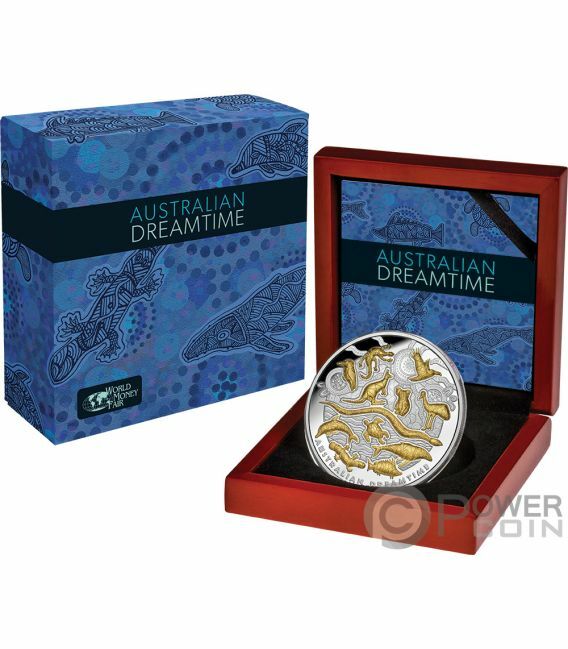 The concept of the dreamtime has subsequently become widely adopted beyond its original Australian context and is now part of global popular culture. The reverse of the coin features a beautiful gilded and detailed vary of different species that can be found in Australia in a modern Dreamtime art design. 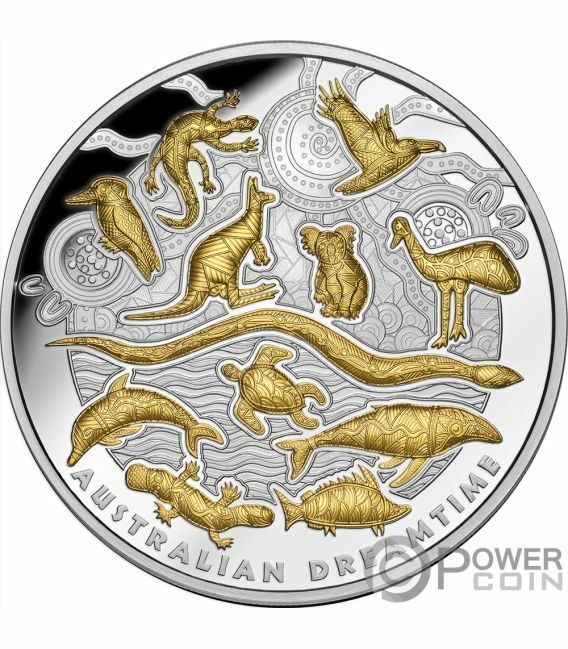 On the bottom of the reverse, the inscription: “AUSTRALIAN DREAMTIME” – the name of the coin. 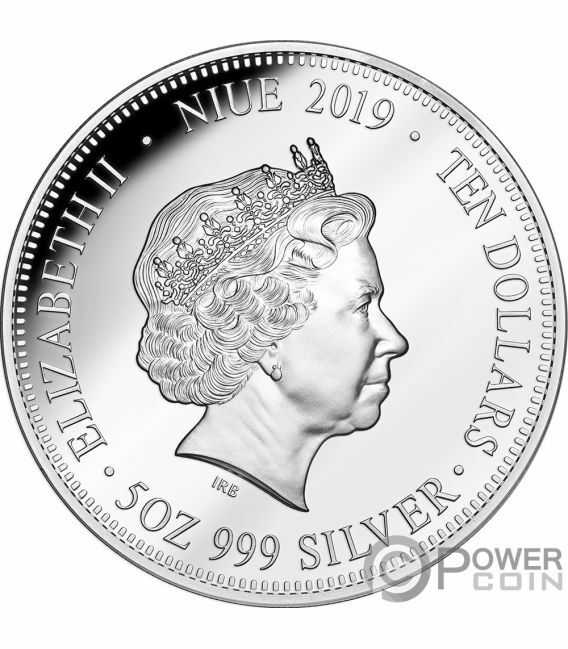 The obverse of the coin depicts the effigy of Her Majesty Queen Elizabeth II and the inscriptions: “ELIZABETH II” – the name of the Queen, “NIUE” – the issuing country, “2019” – the year of issue, “TEN DOLLARS” – the face value and “5OZ 999 SILVER” – the weight of the coin and the fineness of the Silver.